MyCockpit: Marty, I want to thank you in behalf of our readers, in participating in this interview, this will be a fascinating interview. As with most fellow builders I talk to, it never seizes to amaze me the things we have in common. Marty Arant is mainly known as www.simpilot.com but most of us really don't know about Marty. We're about to change that. 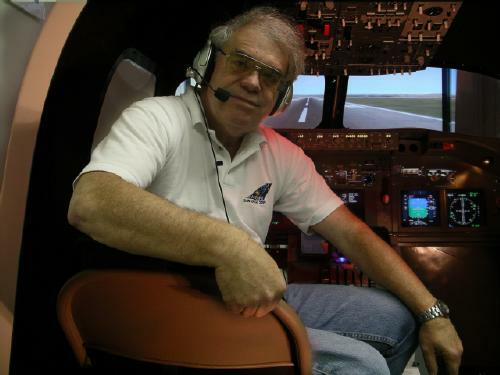 Marty, would you give us a little background about yourself, how you got involved in flight simulation, and how Vmax got started? Marty: Well, it now seems so long ago. 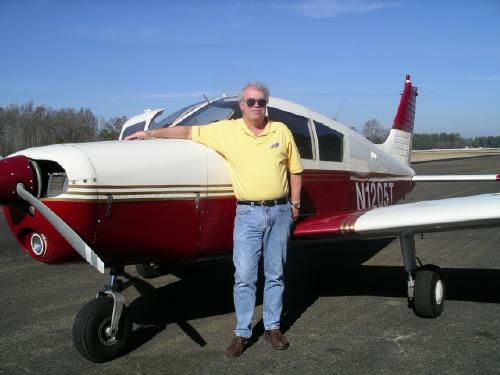 I’ll get right to the crux of the matter and let everyone know I’m 58 years old… so I’ve been around for quite sometime and have seen some fantastic changes, including those to our flight simulation hobby. First and foremost I’ve always had my head in the clouds. When I was only 10 or 11 years old I used to lie down in the back yard of our house in Alabama and watch the little airplanes flying over on their way to the small airport near where we lived. Little did I know then that there was this thing called a 45 degree entry to the downwind and our house was right under it. After attending engineering school in Chicago in 1965-1966 I spent a few years in electronics, moving to California in 1968. It was here I heard about the fantastic opportunities in computers and started pursuing this as a career. I joined a small computer start-up company called Wang Laboratories and it was here that I got into computer sales/marketing. I finally ended up with my own small computer marketing firm. By the early 1990s I was a dedicated flight simulation enthusiast… having started out with the first PC version on an original IBM PC. My first exposure to the add-on product market came a few years later… from some of the early Sublogic and BAO products. By this time I was doing some consulting in the virtual reality market both here and in Japan and had formed a company called AETI… which stood for Applied Emerging Technologies International. Believe it… it didn’t take me long to figure out I could combine my interest in computers and virtual reality with my love of flying. We gradually started picking up add-on products to distribute and eventually started publishing our own products, the first of which was an aircraft add-on called “Jet Age.” We then went on to publish the ProFlight 98 and 2000 products and later the Ready for Pushback 747-200. In 2000 my wife and I purchased my childhood home in Wetumpka, Alabama and moved here in order to have a less hectic lifestyle. Because we needed to reincorporate the company here in Alabama we incorporated under the name Vmax Flight Systems. MyCockpit: Now, how many people have heard of Wetumpka, Alabama? I just raised my hand, that's because I used to live there. A beautiful and peaceful town, indeed. I think most of us know about "Jet Age, ProFlight, and of course the name AETI, an intricate part of our flight sim hobby. We'll get back about Vmax in a bit, but first, tell us about your Flight-Sim building experience. How did you get started in actually building a cockpit? Of course, tell us what you have and are building. Marty: It’s actually hard to pin down a date that I started working on my own cockpit. Back around 1996 I had built a motion-based cockpit based on an F16 using an upgraded Thrustmaster shell and Falcon 3.0 by Spectrum Holobyte. Actually I designed the unit and had a couple of Air Force engineer types build it for me. I did a lot of corporate events with it around the country, including the Rolling Stones Voodoo Lounge Tour in California. But the idea then was to market the product to the much-anticipated virtual reality location-based entertainment market…something that, pardon the pun, never quite “took off” as expected. But once you’ve flown a simulator in a real cockpit with real controls you’ll never be happy again flying with a keyboard and monitor. Still, due to a lack of space, time, and money, I had to get by with a pretty typical FS setup for many years. Gradually though my flight simulation business I began to add more and more hardware items to my product line, starting with my own yoke, the AFCS series, manufactured under license from Precision Flight Controls, and then later, Vmax became the exclusive worldwide distributor for GoFlight products. So gradually one corner of my office began resembling an airplane. All along I had wanted a real enclosed cockpit, but I dreaded the thought of the hammer and nails part. Then I was in Florida visiting a company involved in real flight simulation training and they had a slightly used cockpit shell for sale… based on the Kingair corporate twin. About the same time I was in Europe for a flight simulation show and ran across the Engravity Company. They had designed and were manufacturing acrylic backlit panels that replicated the Captain, Center, and First Officer instrument panels for the Boeing 737 NG. Amazingly and by pure coincidence, these 80% scaled panels would fit perfectly into the Kingair fiberglass shell I was looking at in Florida. Thinking to myself that such good luck would never come my way again… I figured I would go ahead and take the plunge. So I purchased the cockpit shell, the Engravity panels along with the required three LCD units required to display the instruments and run the Project Magenta 737 networked software. I also found two very small touchscreen LCD displays for the flight management system. I already had a fairly nice center console built up from GoFlight components, but now I disassembled it, bolted two separate GoFlight floor standing racks together and painted it and the GoFlight modules Boeing gray. Starting in October 2004 I had everything fairly well assembled… and running by Christmas of the same year. This past year I’ve added the Engravity Overhead panel and the recently-released Ivibe Tactile Feedback System. About the only thing left on my wish list at this time is a multi-channel visual display… instead of the single projector visual system I am currently using. Over the past dozen or so years I’ve had the opportunity of flying a variety of Level-D airline simulators around the world and it really is amazing how much of this technology we can now replicate in our home-built cockpits. MyCockpit: Well Marty, it sounds like you've been around the block a few times and obviously developed some good cockpit building experience. As you mentioned regarding "good luck coming your way" I think several cockpit builders can relate to that. The real simulator experience and not necessary the real flight experience seems to be the one thing that influences most builders in building their own Sim. If you had a choice, of all the Real Cockpit Flight-Simulators you've experienced, which one were you most impressed with, and of course tell us why? Have you had the opportunity to visit other Sim-Builder projects, perhaps tell us which one(s)? Marty: I've not had the opportunity of visiting with many home cockpit builders, but because of our software and hardware development, I have had the opportunity of spending time in the simulators of most US based airlines, as well as one major European carrier. I would have to say my most memorable experience was at the United Training Center in Denver, Colorado several years ago. I had gone to Denver to help prepare for the Avsim Conference and Exhibition and was invited to preview the simulation experience that was being offered to attendees by United. I had previously flown various high-end flight simulators before, but this was a new-technology 777 extended-range level-D simulator. The report on my adventure is on Avsim at http://www.avsim.com/pages/0504/ual_777/ual_777.htm But what I find absolutely amazing is the detail and fidelity that can now be built into a home cockpit. In many ways. the graphics and sensory input is equal to or even exceeds what is available in the high-priced airline and military simulators. MyCockpit: I too have had the United Training Center (Denver) experience, and it is certainly was very motivating, as a builder. You have experience with multitudes of Flight-sim products, tell us about the ones that moved you the most, the ones you say "WOW that's amazing." Can you share any information about up coming products, or just give us a hint of what's coming? Marty: There are now so many outstanding software products out there that it would be hard to list them … so I’ll concentrate just on hardware. Certainly the most recent and I must say, profound product that I’ve tried is a tactile feedback seat from ivibe.com. Now like many of your readers, I’ve tried subwoofer seats that are driven by the simulation sound system. This is different. This seat actually contains motors and is driven from a specific FS2004 driver. This means you get vibration on takeoff, for example, whose frequency is directly tied to ground speed and/or RPM. And when you lift off the wheel effect fades and then you feel a “bump” when the wheel is retracted. The effect is similar when landing and hitting the reversers. This product is brand new so many of your readers probably haven’t heard of it before… but I suspect they will in the near future. I’m not a dealer or representative of this company… so I have no reason to recommend it except that it is just simply a fantastic addition to the sensory effects available in the home cockpit…and all without spending big bucks for a motion system! As the exclusive worldwide distributor for GoFlight I certainly feel this line of products is at the top of my list. What is so great about GoFlight is the ability to add components piecemeal as you can afford them… until you’ve built up your entire cockpit console. And it’s a great way to sneak your cockpit by your spouse one little box at a time. The GoFlight stuff is USB plug n’ play and is really easy to configure. As to my wish list, I was at the FS Weekend convention in Amsterdam several months ago and WOW… talk about “high end” products. First on my dream list would be the $3,000 Boeing 737 throttle system with real actuators and moving trim wheel that I saw at a booth at the show. Well… maybe if I ever win the lottery! MyCockpit: Marty, it's been a wonderful experience, having the opportunity to interview you. I have so many more questions, perhaps leave those for another time. In behalf of my fellow flight-sim builders I want to thank you for participation. Are there any last comment you'd like to make. Marty: Well, some twenty plus years ago I purchased my first computer, an IBM XT, and loaded the first PC version of flight simulator. At that time it was a crude black & white image with some basic instruments. The engine sound was made by a series of "clicks" generated by the PC speaker. Now, sitting in front our projection systems with these breathtaking graphics, audio and flight models, it's just amazing to consider how far desktop flight simulation has come during the past twenty years. And to think. if all of us had been born just one generation previous to the present one, we would have missed all of this. I think I speak for my fellow flight simulation enthusiasts when I say, "these are truly wondrous times!"